This is a Fashionista Event and a promotional item was provided to me. Hosts for this event are Still Blonde after all these Years and ModlyChic and hyatt world. We all dream of the best vacation for our family. I guess that’s the difference of being a single and having kids. You no longer enjoy travelling alone since you will have that lingering guilt of not having your kids with you during your travel. But travelling with the whole family means a lot of things to consider, from spending your hard earned money and the security and comfort of your kids. My family loves the ocean and a vacation at Fort Launderdale Florida would be a great hyatt winter dream for all of us. Isn’t it an amazing feeling to enjoy the tranquil mood of the ocean and sit beside the long beaches of Fort Launderdale and enjoy the slower pace of life. It will also be a good feeling to go scuba diving again and see the richness of the ocean. I haven’t done that for quite sometimes and just the thoughts of it excites me. While other family loves going to the busy city or going to Disneyland, we still prefer the peaceful and serenity of nature. Hyatt is a widely recognized, industry leading brands who is committed to give global hospitality and excellence to its consumers. They create an environment for people to thrive by building strong communities and fostering sustainable environmental practices. That’s why there is no doubt that many people would consider them to be one of the best place to enjoy a relaxing vacation or even a staycation. At Hyatt Regency Pier Sixty-Six you will surely experience what relaxation means. It’s beauty is beyond compare having surrounded with water on all sides and perfectly placed in a luxury garden marina. You can stroll the ocean and find that perfect spot in the sand and watch the waves roll in and yes you can always experience good weather. We will definitely be saving up for this grand hyatt dream. If you are someone like us who loves the beauty of nature, you can also experience what Hyatt can offer, Book directly at Hyatt.com, you can assure of great discounts for bookings made at Hyatt.com, experience free Wifi at all Hyatt Hotels and Camp Hyatt program at Hyatt Resorts in US and Caribbean. Since we all know the wonder of what social media can do. You can also assure of fantastic locations, family friendly programs and rooms, multiple brands at various price points and definitely something that can fit your budget. Now till November 30, you can Enjoy 20% off stays of 2 nights or more and 25% off stays of 3 nights or more at the following Hyatt Hotel locations! Use Code: WSALEA . Make sure to check out their exciting packages and freebies too when you avail the code. It’s definitely a magical feeling on hyatt world. Now, here is the best catch of all. Hyatt is sponsoring a Giveaway for a $500 Hyatt Digital Gift Card. Make sure to enter via the Rafflecopter. Good Luck and let us make our dream vacation come true. Giveaway is for US only, 18+. This contest is in no way connected with any social media and this blog is not responsible for prize fulfillment. Prize will be given directly by the sponsor. When I become a mom, i always love taking pictures of my little ones. Since we have waited for a long time before our Peachy was born, upon her arrival, it was just given to take so many pictures and sweet memories of her growing up years. RealTimes was built around stories that you create – it’s indeed a great way to track your children’s years. Memories of great days captured in pictures and videos are very important for me so it would be a tragedy to just lose them and storing them through my computer or smartphone has a high risk of getting deleted or eventually corrupted. So, it’s a great news to learn about an Online cloud based service that can help me store this precious memories of my children. Premium RealTimes is an app by Real Networks . Basically, the app picks the best moments from your smartphone and video collection and create automatically a montages that was perfectly organized with location and date . Subscribers can sign up for their FREE plan which includes 2GB of storage. by using this code, COUPONSCOM15 , you’ll get a discount but make sure to check the apps since this discounts is offered from July 14 to August 30, 2015 only. Now, here’s the best part. By joining this giveaway, you get a chance to win $300 worth of Target Gift Card. You can buy a lot of things from there. Perhaps a new toy for your children or a nice home accessories just like the last item i bought from them. The contest runs from July 23 to 31, 2015 only, so make sure to come back everyday to get a bigger chance of winning 🙂 18+, US residents only. Disclaimer: Still Blonde after all these Years, Modly Chic, and Fashionista Events bloggers are not responsible if prize is not delivered. We will make every attempt to help you claim your prize. Disclosure : This is a Fashionista Event and a promotional item was provided to me. Hosts for this event are Still Blonde after all these Years and ModlyChic . Fitness Fashion and Freebies is not responsible for the prize. My father always taught me that, for someone to be happy in life you must stored your memory bank with beautiful happy memories so that when sadness occurs, you will find joy within you. That same principle is what my husband always tell us, he often says that happiness can be found not only on having everything but with the joy of sharing beautiful memories with your family. That’s why we always make time to go outdoors and enjoy the beauty of nature. Whether it’s a visit to a nearby hill or trekking the mountain or walking along the shores of the beach, we make sure that we all had a great time and memories to keep. That’s why every Father’s Day, me and my daughter would always find simple gifts for the great man in our life. He was not a materialistic guy and his too frugal too that’s why we just buy the things that is necessary for him. That’s why it’s a great timing to learn about Cabela’s Father’s Day Deals. Cabela’s understands that fathers just like mothers should be pampered too with the best gears you can find. If your dads loves the outdoors and outbacks, their quality outdoor equipment would be perfect for them. Shop at Cabela’s Father’s Day Sale and save up to 50%, this will be available from June 11 to June 21, 2015 and whether your dad is a shooter, fisherman, hunter, boat lover or perhaps your household great chef, you can definitely find the best gift for them by following their Father’s Day Gift Guide. Looking at Cabela’s Father’s Days Gift Guide, i believe that my husband would be thrill to get this Eagle’s Camp Family Voyager 8-person tent. He has been telling me that we should get one but it’s just that those we find in the mall is too small or to big for us. This tent would just be perfect and what’s more, a better value and my husband would be excited to get one. To learn more about ideas on how your favorite man in your life would be happy, Check out Coupons .com for great Father’s Day deals and definitely you will find one or two or even many gifts that they would surely love and appreciate. My personal favorite are the gifts for the campers and chefs. Psst: Great Father’s Day sale starts June 4 through June 21, Father’s Day. Also, don’t miss Free Shipping on clothing & footwear – $49 min starting June 4. Now, here’s the best part. From May 28 to June 12, 2015, US /Canada 18 up, you can get a chance to win $300 Gift Card and can be used to find a great Father’s day gift from Cabela’s products. That’s really awesome, all you need to do is enter the rafflecopter below and make sure to finish all the requirements to get a greater chance on winning. As we celebrate the day for woman and mother’s all over the world. Here’s an exciting giveaway sponsored by Sunglasseshop for all Fitness Fashion Freebies pretty subscribers and readers. Ralph Lauren Eyewear are timeless, chic and definitely for all fashionista. To know more about Ralph by Ralph Lauren sunglasses, hop to my review about this timeless glasses. Get to win a choice of ralph lauren sunglasses from Sunglasseshop.com up to value of $116 worth. May the Luck Be with You! Make sure to do all the entries and come back for more chances to win. Please wait for the rafflecopter form to load. Welcome to the May the Luck Be With You Giveaway Hop, brought to you by The Hopping Bloggers & Up All Night Blogging! Each blogger participating in this hop has a giveaway with a prize value of at least $15 – and some are much more than that! Be sure to scroll down the whole list and visit them all – there is no limit to how many prizes you can win! There will also be a twitter party on May 19th to go along with this hop with even more chances to win. RSVP for that by clicking here. Good Luck and Have Fun! DISCLOSURE: Mama Smith’s Review Blog and Women and Their Pretties, Fitness Fashion and Freebies are not responsible for any of the prize fulfillment. Each blogger is responsible for providing their sponsor with their winner’s contact information. 18+, Us only. Winner has 48 hours to respond on e-mail notification otherwise a new winner will be randomly selected. This giveaway is in no way connected with any social media. Prizes will be delivered by the brand/pr. Easter is definitely eggciting and this giveaway is surely something you wouldn’t missed joining. You can also check out the other giveaways on the link hop. One winner will get a chance to win this fabulous and fashionable prizes, so make sure to come back everyday for more chance of winning. This will definitely an easter fabulous giveaway. Please wait for the giveaway form to load. If you encounter problems or error, please do let me know so i can fix them at once. Goodluck! Welcome to the Hippity Hoppity Giveaway Hop, brought to you by The Hopping Bloggers & Up All Night Blogging! Each blogger participating in this hop has a giveaway with a prize value of at least $15 – and some are much more than that! Be sure to scroll down the whole list and visit them all – there is no limit to how many prizes you can win! There will also be a twitter party on April 14th to go along with this hop with even more chances to win. RSVP for that by clicking here. Good Luck and Have Fun! Disclaimer: I received a certain compensation for this post but all thoughts and opinions are mine. Giveaway is in no way connected to any social media. US only, 18+. This site is not responsible for prize fulfillment. You have heard me talked about it many times in this site that street style is indeed the new hot item. From Fashionable dress to shoes and accessories, there are many beautiful choices that you can find in the net. One shop that I have found recently is Walk Trendy, true to it’s name, their collections are indeed trendy and seems very affordable to unlike other online shops I have encountered before. What makes it more amazing is the fact that it has an Asian touch and very modern but will definitely help you stand out from the crowd or make prettify you in just any occasion you will be attending. From casual dresses to special occasions and cosplay, they will definitely have something for you to choose from. With their aim to provide of wide range high quality products and trendy fashion clothing at a factory price. Walk Trendy is definitely something worth checking out. Now, here’s the best part. They are offering one of my readers a $50 (online GC) for you to experience and own one of their trendy products. Make sure to visit again since the giveaway will start on a few days. Hello Beautiful ladies. I’m inviting you again to join the Spring Fashionista Giveaway. My prize alone is worth $400 of fashionable goodies that you will surely love. Whether it’s for you or for your friend, this giveaway is definitely worth checking out. It is not all that, since it’s a hop more than 80+ event participants are included in this huge Fashionista giveaway and more than thousands of prizes are definitely waiting for you. So better hurry because this will end soon and I tell you, you will regret when you did not join because you will never get the chance to win those lovely prizes. So, just click this link for you to join. The last Fashionista Event was a huge success for me and although it was my first time to join the giveaway hop, I was overwhelmed with all the support of the participants and I do hope that some of you still reads my site even the giveaway ended. Fitness Fashion Freebies along with it’s sponsors is part of The Fall Fashionista Giveaway Event which is hosted by The Chief Blonde at Still Blonde After All These Years http://stillblondeafteralltheseyears.com and Katy from Modly Chic http://www.modlychic.com/. All Fashion! Only FASHION event! Largest Fashion Giveaway event on the internet with $26,000+ in prizes, 100+ participating blogs and 3/4 million entries. Each individual blog has a minimum of $125 prize! 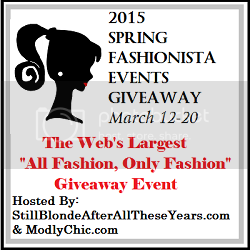 The SPRING Fashionista Events Grand Prize is $500 PayPal (worldwide where allowed by law). For every giveaway in the Fall Fashionista Event that you enter, you gain one entry toward the Fall Fashionista Grand Prize. 1 Grand Prize winner will receive $500 PayPal cash. 1 first prize winner will receive $300 gift certificate to Monroe and Main. That is simply amazing. Now, this spring fashionista giveaway will not be possible without the generous offer from this following brands/company. It’s a total package from bag, accessories and shoes. Definitely every fashionista would love to have. Please do read each review to learn more about them. Designed to be a laptop bags that you will love. It’s not just for laptops, it’s versatile and spacious and definitely a must have for every fashionista. Read my full review about Knomo London Bags here. Inexpensive designer frame glasses that are trendy and sophisticated. Polette frames is simply stunning. Read my highlight review about Polette Sunglasses or better yet check them out today for more designs. Jewels for Hope was founded by Sandy D’Andrea back in 2009. She found her calling of creating one-of-a-kind jewelry with a purpose , to give back. After sometime, her eldest daughter Stevie Lynn joined the team. Each pieces of jewelry they created was made from the heart. Famous Hollywood actress and known personality like Jennifer Love Hewitt, Rodney Atkins and Rose Falcon have already been seen gracing Jewels for Hope jewelry. Check them out today and read my full review of Jewels for Hope and their advocacy here. Leader in innovative shoes design. Zipz can satisfy fashionista’s desire to have stylish and creative shoes. Read my full review here. Winner will get to have their own choice of 1 (one) pair of shoes from available stock. value at $64.95. A Rafflecopter form should appear below in 30 seconds. If you don’t see the form or you spot an error on it, please send me an email to melandriaonline@gmail.com so I can fix it in no time. Make sure to bookmark this page and come back each day for your daily entries. Disclaimer: 18 years of age or older to enter. US Only! Read Instructions carefully because rules vary from contest to contest. Make sure to provide a correct email address so I can reach you if you win. You have 48 hours to respond once contacted. Fitness Fashion Freebies or the Spring Fashionista Events Giveaway bloggers are not responsible for sponsors/bloggers that do not fulfill their prizes or for any product failure or harm caused thereby. In most cases, shipping of prizes is the responsibility of the the sponsors who will be sending prizes to you directly. Your prize should arrive within 30 days, let us know if it doesn’t and we will TRY TO HELP OUT! I received a sample product for this review but no compensation was provided. Opinions expressed are the blog’s own and may differ to others. All pictures are mine unless specified otherwise. This Giveaway is not affiliated with, associated with or promoted by Facebook or any other social media. The holidays are upon us. When we think about the parties that we will have, we want to have great items around. Jay Companies is the place to get some great items for your entertaining. They have a wide range of items from dinnerware, to bar ware, to home decor and everything you would need to have a party with. Weather you are entertaining 5 people or 50 people you can expect great things from them. For over 50 years The Jay Companies has specialized in fine and casual dinnerware, crystal stemware and giftware, table charger plates and decorative accessories. Quality and fashion have been the hallmark of the Jay brand for over half a century. Founded in the early 1950’s by Paul and Erna Jay, The Company began doing business in Italy, Portugal and Spain. The Jay Companies has since added the Czech Republic and Turkey to its list of European sources as well as product from the Far East. Their ability to manufacture all items in very large quantities presents us the unique opportunity of bringing designer products to our customers at extraordinary pricing. They are always mindful of ever changing styles. Jay’s design team pays great attention to the latest trends and fashions. The company’s quality control department pays careful attention to both product and packaging, ensuring customer satisfaction. Disclaimer: The participating bloggers have not been compensated for this post. No purchase is necessary to enter. One entrant per household, per address. Void where prohibited by law. Winner(s) will be contacted by email and have 48 hours to respond before a new winner is chosen. The sponsor(s) will be responsible for product shipment to winner(s) of this sweepstakes. This event is in no way administered, sponsored, or endorsed by, or associated with, Facebook and/or Twitter, Google, Pinterest. Contact Sharon@mompoweredmedia.com if you have any additional questions or comments. 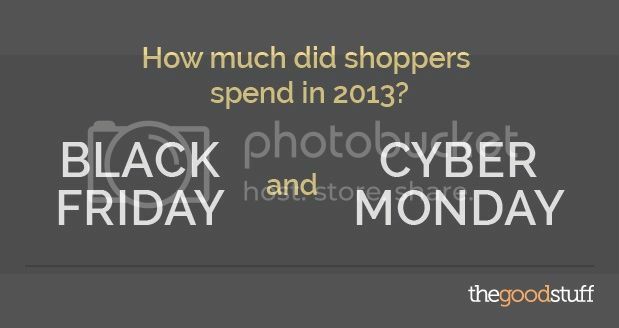 Each year, I think the most awaited event is Black Friday and Cyber Monday deals, it is because of the fact that it was really a great chance to grab the lowest price and best deals in stores and online shop. I know some friends who even save for few months so they can spend them all during their thanksgiving shopping. I love shopping but i dreaded the sites of too many shoppers. It always makes me feel dizzy and sometimes suffocate me. The worst part is I might throw up, that’s why I always don’t go to busy places with lots of people. I always prefer shopping online and taking the advantages of Black Friday online sale since the collections are also endless and i get to save from fuel and effort of going through long lines but the best part is I can celebrate thanksgiving with my family since I believe that thanksgiving should really be giving thanks for the things you have. Last year, i was able to grab some pretty fashionable things for me and my kids. 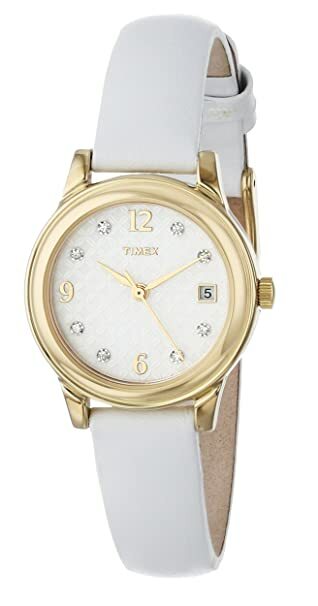 Dress, Keds for half a price, pretty hand bag for 30% off and lots of chocolates for a very reasonable and awesome prices but the best purchase I have ever made last Black Friday is this beautiful white Timex women classics with swarovski crystal and leather strap watch. The original price is $54.95 but i got mine for only $19.99 that’s more than 70%. Talking about value for money and fashion forward purchase, you should also check out Coupons.com Black Friday Giveaway. 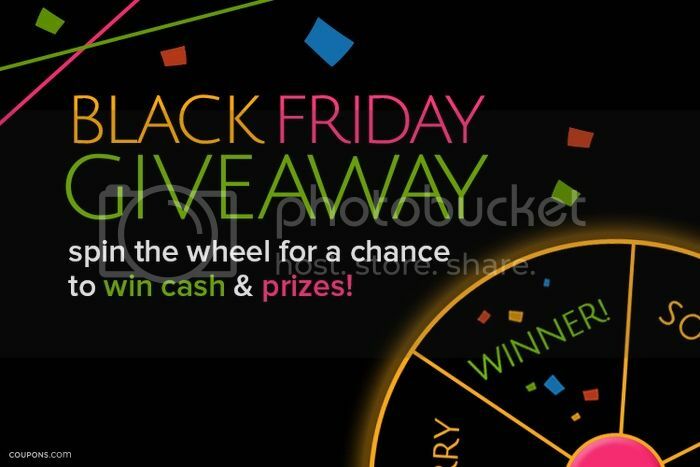 By joining, you get the chance on the daily instant prizes just by spinning the wheel. I tried it but it seems I’m not lucky today but the be1st part is I’m still eligible to win the $10,000 Grand prize. That’s a lot of money and you will definitely have a grand shopping spree. I definitely love giveaway, i hope I can be lucky next time. Going back to Black Friday deals , the Black Friday articles on The Good Stuff is a must read to find deals, it’s a great resources for everything you need to know about Black Friday shopping and of course finding the best fashion deals for every fashionista. I read about the coupons.com black friday sweepstakes and some tips to help me survive the Black Friday shopping. I love coupons, any frugal mom like me would always love to have an extra discount because once it’s accumulated will be a lot of savings. So, what are you waiting for? Get your hands and eyes ready. Check out the best deals for this coming Black Friday and Cyber Monday as early as now, so you know what to purchase and you save time browsing. As of today, i already have some few in my cart, so when the time comes, all I need to do is to click that purchase button. Remember to enter the coupons.com black friday giveaway, you can check daily through December 7. Welcome to the Christmas Gift Giveaway from My Starlight Blessings Christmas Holiday Gift Guide 2014. Christmas is a time for gift giving and a time for showing our loved ones how grateful we are to have them in our lives. Christmas is also a time for winning giveaways!! Enter for your chance to win a Plasmart Toys “Squashed”, a blue orange “Spot It Disney Frozen”, The Orb Factory “Pulsar Powerballs”, Wild Kratts Activate Animal Power 2-Pack – Lion & Wild Life Plush – Spot-Swat and Briefton’s Instant Veg Spiral Slicer. Good Luck Everyone! Disclosure My Starlight Blessings and Fitness Fashion & Freebies are not responsible for prize fulfillment on the giveaways. (in accordance with the FTC’s 16 CFR, Part 255: “Guides Concerning the Use of Endorsements and Testimonials in Advertising”): Many thanks to the sponsors for providing the prizes for the giveaway. Choice of winners through giveaway tools and opinions are 100% my own and are NOT influenced by receiving a product. The Winner is subject to eligibility verification.” The winner has 48 hours to reply back to the email or a new winner will be selected. The giveaways are not associated with any social media they are shared on. Miá Mariú believes in bringing beauty and health into harmony. They make fabulous products from their Botanical Beauty lines, Life and Body Plus products, MIneral Makeup beauty lines to their premium scent collections. You can read Debbie from Heartbeats~ Soul Stains review of the RestauraCel-C Thermal Microdermabrasion Set here. This is a fabulous product that gives great results in the comfort of your own home. Miá Mariú is responsible for fulfillment, shipping and all costs associated with this prize. I’m really excited about this Fall Fashion Giveaway. Why? I can’t get enough looking at this beautiful pieces of different fashion things. From bags, apparel and jewelries, I can get the chance to win them just by doing simple tasks which will not cost me much time and yes $500 paypal for the grand prize. So, if I were you, i won’t let this chance past. Now, I’m doing my rounds on all the giveaway. Don’t forget to join mine too. This fashionista event is made possible by below host. Fitness Fashion Freebies along with it’s sponsors Baroni Design, The Bumble Collection and See Kai Run is part of The Fall Fashionista Giveaway Event is hosted by The Chief Blonde at Still Blonde After All These Years http://stillblondeafteralltheseyears.com and Katy from Modly Chic http://www.modlychic.com/. All Fashion! Only FASHION event! Largest Fashion Giveaway event on the internet with $26,000+ in prizes, 100+ participating blogs and 3/4 million entries. Each individual blog has a minimum of $125 prize! The FALL Fashionista Events Grand Prize is $500 PayPal (worldwide where allowed by law). For every giveaway in the Fall Fashionista Event that you enter, you gain one entry toward the Fall Fashionista Grand Prize. 1 Grand Prize winner will receive $500 PayPal cash. 1 first prize winner will receive $300 gift certificate to Midnight Velvet Clothing. Isn’t that stunning? Baroni Designs satisfy the passion in every woman. From handmade products that are truly captivating. Each pieces is definitely something worth having. Read my brand spotlight/review here. They pledge to give my reader a beautiful Empress Bracelet worth $95.00 from their latest collection. See Kai Run offers shoes for different ages. They produce features with the best materials and construction for kids of all ages and gives them comfort and style. The Bumble Collection offers moms the best experience of being a mother with their pretty bags and accessories. Read my review to know more about why this product is trusted by many Hollywood Moms. The Bumble Collection is offering my reader a beautiful Brittany Backpack worth $68.99. Can’t wait to win it? Buy it at Baroni Designs, The Bumble Collection , See Kai Run . Disclaimer: 18 years of age or older to enter. US Only!Read Instructions carefully because rules vary from contest to contest. Make sure to provide a correct email address so I can reach you if you win. You have 48 hours to respond once contacted. Fitness Fashion Freebies or the Fall Fashionista Events Giveaway bloggers are not responsible for sponsors/bloggers that do not fulfill their prizes or for any product failure or harm caused thereby.In most cases, shipping of prizes is the responsibility of the the sponsors who will be sending prizes to you directly. Your prize should arrive within 30 days, let us know if it doesn’t and we will TRY TO HELP OUT! I received a sample product for this review but no compensation was provided. Opinions expressed are the blog’s own and may differ to others. All pictures are mine unless specified otherwise. This Giveaway is not affiliated with, associated with or promoted by Facebook or any other social media. Updated: First of all, I want to thank all of our participants for joining this Fashionista Giveaway. As well, as our generous sponsors for this opportunity. Till Next Fashionista Event. I have always wanted to join the Fashionista Events, it’s one of the biggest Fashion Event Giveaway with more than 100 bloggers participants and lots of prizes to be won. Now, at Last, I was able to join this huge event so I do hope you can join in my blog and leave some loving comments on my sponsors too. This fashionista event is made possible by below host. Enter to win a Personalized Puzzle from Piczzle!!! Piczzle creates beautiful puzzles from your treasured pictures. They come in all kinds of sizes from six pieces to 2,000 pieces. Read A Small Village’s Review HERE and see the awesome job they did on her daughter’s new born photos. Here’s a puzzle giveaway that you would surely love. Join and experience the fun. You can win a puzzle of your own below! Remember to come back daily for more entries. Giveaway is open to U.S. and Canadian residents, 18 years and older. A Big Shout Out To ALL Other Participating Blogs! The Mia Mariu philosophy makes the connection with Beauty and Health in Harmony. Mía Mariu’s high performance products are formulated with the most natural ingredients available helping you achieve vibrant beauty and health inside and out. Each unique product fuses nature and technology by combining the highest quality botanicals, antioxidants, vitamins, minerals and peptides. The result? healthy products that provide a perfect balance that reflects itself through youthful, healthy, beautiful, glowing skin and renewed energy and vitality, at an exceptional value. Mía offers natural skin care, professional makeup artist quality mineral cosmetics and brushes, fine fragrances and nutritional supplements to Reveal Your Unique Shade of Beauty! Start Thinking Of Your Color Choices for Each of The Above Products! So 1 LUCKY Winner will receive all of the products that I received in their own color choices! $90 ARV! in the Continental United States. Entrants must be 18+ years of age to enter. This giveaway will end at 12:00 AM (EST) 10/23/2014.